Abstract: Consider it future proofing or looking ahead, USB2.0 is arriving quickly, and there isn't much point in getting outdated technology now is there? USB 2.0 devices really haven't reached a high saturation point yet, but when they do it will be good to know that there are already a host of peripherals out that will let you expand the number of ports you have. One such USB2.0 comes from the folks at Belkin, and besides adding four backwards compatible USB 2.0 ports to a computer, also attempts to breach the design limits with a funky spaceship like look. The Belkin 2.0 USB Hub runs for about $70CDN. Of course if you already have the Belkin USB 2.0 Hi-Speed PCI card you will be set. But in any case, if you have been looking around the market place it may be wise decision to spend a little extra at this time and set yourself up with a USB2.0 compatible hub instead of a simple USB1.1 hub. Consider it future proofing or looking ahead, USB2.0 is arriving quickly, and there isn't much point in getting outdated technology now is there? With USB 2.0 devices are no longer restricted to the lowly 11Mb/s USB 1.1 had to offer, 480Mb/s now opens up the use of USB to external harddrives, CD-RW's, video cameras and like devices. 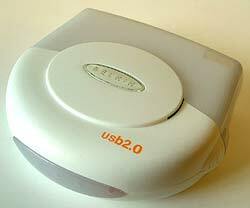 The USB 2.0 hub comes with one USB-A to USB-B cable and a big AC adaptor. Installation of the device is as simple as plugging in the cables to the appropriate ports, no drivers are necessary. The hub should be detected by any recent versions of Windows as though it is just another generic USB Hub. On the front of the hum are five LED's which light up once USB devices are attached, and blink when they are being used. While the rear of the USB hub is not labeled, it's pretty much common sense on where each plug will go. The lone USB-B port is for the cable connection the hub to the computer, and yes it has to connect to a USB2.0 compatible port in order for the devices to communicate with the computer at that standard. Aside from the DC power jack there are four USB-A ports. If you had enough hubs and cables, you could attach a total of 127 USB devices at once which is kind of astounding.... and could be interesting if each device was a hard drive. To test the unit, we attached our (ugly) USB 2.0 media bay with a 40GB Samsung HDD inside to the hub and did some large file transfers. The USB 2.0 Hub didn't hinder performance one bit, with a 1 GB file transfer taking 85 seconds to transfer to the internal drive. In the SiSoft Sandra benchmarks the media bay scored 10947 points. 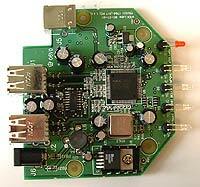 Conversely a score of 11462 was scored when the USB 2.0 media bay was directly attached to the Belkin USB 2.0 PCI card. The performance of the Belkin USB 2.0 Hub is very good and we didn't see anything to indicate it was slowing down transfers of data. However, please keep in mind that with very few USB2.0 products on the market we were only able to test one simultaneous data transfer at a time. The hub is ridiculously easy to set up, and given the quality we have seen from Belkin in the past should last for quite some time. This is important because USB2.0 is still a few months away from being mass marketed to consumers. When that happens, the USB2.0 hub from Belkin will make an excellent way to connect all those devices together!